Easter Island or Rapa Nui is one of the world’s most isolated inhabited areas. It is a Chilean island, located in the South Pacific, 3510 kilometers (2181 miles) west of the country’s mainland. Easter Island stands alone in the sea; the nearest island is some 450 kilometers away and is uninhabited. It is a small mass of land, only 164 square kilometers, which rose up from under water due to a volcanic eruption. You don’t want to miss this island if you are traveling to that part of the world. Easter Island is accessible through the Mataveri airport. LAN Airlines (formerly LanChile) flights travel there twice a week from Santiago and Papeete. The island offers a beautiful landscape and impeccable scenery. It is ideal for beach camping, hiking, and swimming. But these are not the reasons you want to go there. You want to travel to this tiny island in middle of nowhere because it lets you be not just a traveler, but an explorer. Easter Island is peculiar because almost all of its shoreline it covered with enormous stone statues, called moai, some as high as 21 meters (69 feet) tall, constructed more than 500 years ago. These statues depict angular faces in phallic structures. There is a mystery that surrounds these statues; for a long time no one knew who erected them, how or why. If one were to visit this island, it would seem that whoever was building them, left in quite a bit of hurry. One can see broken moai along the paths of the island, while others lay uncompleted elsewhere. There has been much speculation about these statues, with even an alien invasion being considered at one point. With time, a convincing enough story has become more popular. The story goes that the island had remained uninhabited by humans for a large part of its history. Some 1500 years ago it was discovered by Polynesian seafarers. They are the ones who settled here and started building the statues. Why they did so is still a mystery. The soft volcanic rock in middle of the island offered ideal rock for carving. Once finished they were cut out from the rock and taken to ceremonial places along the shoreline. In these ceremonial places, called ahu, they were erected. The carrying and erecting of these massive rock statues not just required immense labor, but also wood. It is now believed that island was once a dense forest of palm trees but they were cut at such an alarming rate that they have now become extinct on the island. What brought down the fall of the Rapa Nui culture of moai statue building is still unclear. Some believe that the extinction of trees messed up the entire ecosystem of the island. With the lack of resources, the clans of RapaNui turned against one another. Much of the remaining population (approximately 2,000 to 3,000 inhabitants by 1722 according to Dutch navigator Jacob Roggeveen) were taken away from the island in Peruvian slave trade in the year 1862. Shortly afterward, Catholic missionaries, in a partnership with businessman John Brander and Frenchman Jean Baptiste Dutrou-Bornier, discovered the island and destroyed most of the culture that was left after forcibly removing all but a few of the inhabitants to the Garnier Islands, while others were forced to work on the plantations owned by the Catholic Church and Brander. Finally in 1876, Dutrou-Bornier, who had continued to act as the overseer of these plantations, was killed in a rebellion by some of the remaining islanders who could no longer tolerate the brutality and harsh conditions. Today, the Chilean government administrates the island as a “special territory” and in recent times has become more amenable to the idea of cultural preservation. 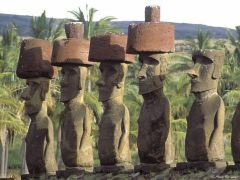 By 1995, conditions had improved enough that UNESCO declared the Rapa Nui National Park a World Heritage Site. However, after all of the devastation from environmental damage, exploitation, tribal warfare, and disease, it is believed that there is hardly any pure RapaNui blood left, which is why the mystery of Easter Island continues with people believing whatever sounds most convincing to them. So explore the fall and rise of a culture in a span of 300 years and discover your story.